The Canon PIXMA iP100 is a stylish high resolution printer for your mobile lifestyle. Keep working at it's best with the latest driver. Today's mobile professional has more pressure than ever to be able to conduct business almost anywhere. The rugged, compact iP100 Mobile Printer delivers remarkable quality and print-anywhere portability. 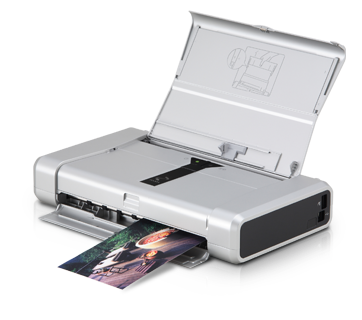 It affords users the ability to print beautiful borderless color photos from the car or even at the beach. Its patented print head technology and 5-color ink system let you create spectacular photos with 9600 x 2400 color dpi1 resolution (max.) How fast? A photo lab quality 4" x 6" borderless print takes only about 50 seconds2. It offers IrDA compatibility3 and an optional BU-30 Bluetooth interface4, so you can print wirelessly from a PC, PDA or camera phone. Or, connect a digital camera and print photos direct—no PC required! An optional Canon car adapter and rechargeable battery kit provide power on the go. Plus, the Auto Image Fix feature corrects images for the best possible exposure, color, brightness and contrast. This printer has increased color resolution with faster printing speeds than previous models, while offering a number of accessories that make it easier to conduct business outside of the office. The lightweight Canon PIXMA iP100 Mobile Printer fits easily onto a desk with limited space or into a carry-on, making it the perfect laptop companion for business or personal travel.